Shall we get right to it? My measurements are for a Kindergarten sized chair. They also work great on Pottery Barn, Ikea, or other small child chairs. To widen add about 5" to the total width at the top of your chair back. If your chair back is 16" your piece of fabric will be 21" wide. To lengthen ... this pattern will make a seat sack that is about 15" in total height. Personally, I wouldn't make it much longer because you want to be able to reach the bottom, but if you decide to add a little add double what you want to add to the length. 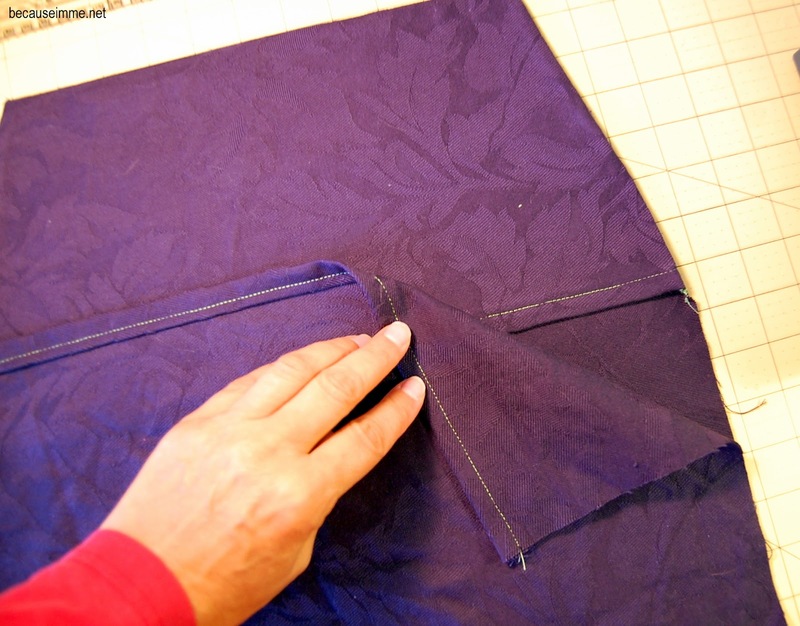 For example, if you want it 1" longer add 2" to the total length of your cut fabric piece. Duck, denim, twill, and other heavier fabrics work best for this project. Your fabric should be the same on both sides, because both sides will be showing. Cut a piece of fabric 15" by 36". Hem the two short edges, one to the top of the fabric and one to the bottom. Looking at the fabric piece they will be hemmed to opposite sides of the fabric (one hem will face you, one will face away from you). Next fold one short end of the fabric down 7", with the backside of the hem facing up, as in the image below. Along the folded edge mark 2" in on both sides. I use a pin, which is then also holding the fabric in place. Also pin 5" down from the fold on both sides. 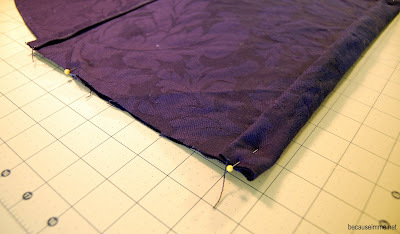 Stitch down the side, beginning at a top pin (remove pin first) to the bottom corner of the hemmed edge. 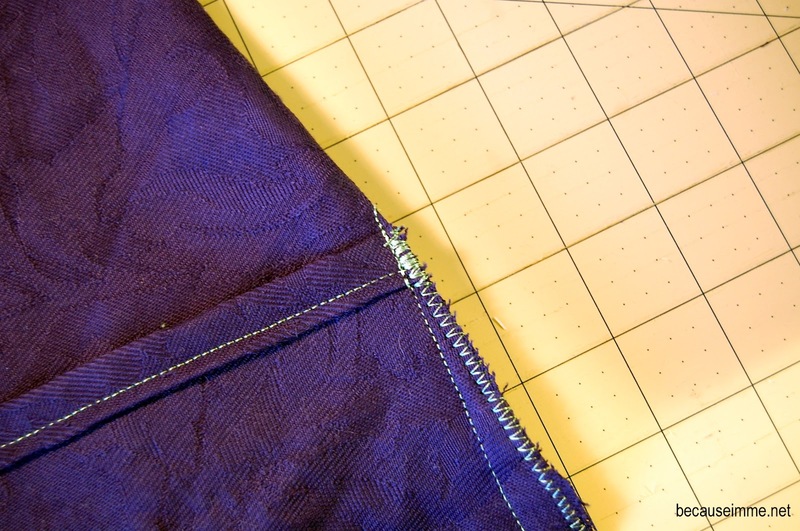 Have your stitching be 1/2" from the edge when you get to the side pin. Reinforce stitching at hem. Trim. Edge stitch along your newly created and trimmed seam, reinforcing at the hemmed edge. 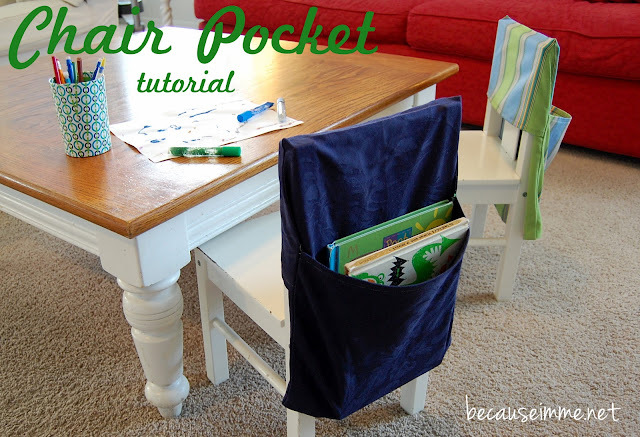 This "pocket" will envelope your chair top. Next create your book/toy/misc. items pocket. Lay your fabric with newly sewn "pocket" facing you, fold the remaining hemmed edge up. The backside of the hemmed bottom edge should be facing you. 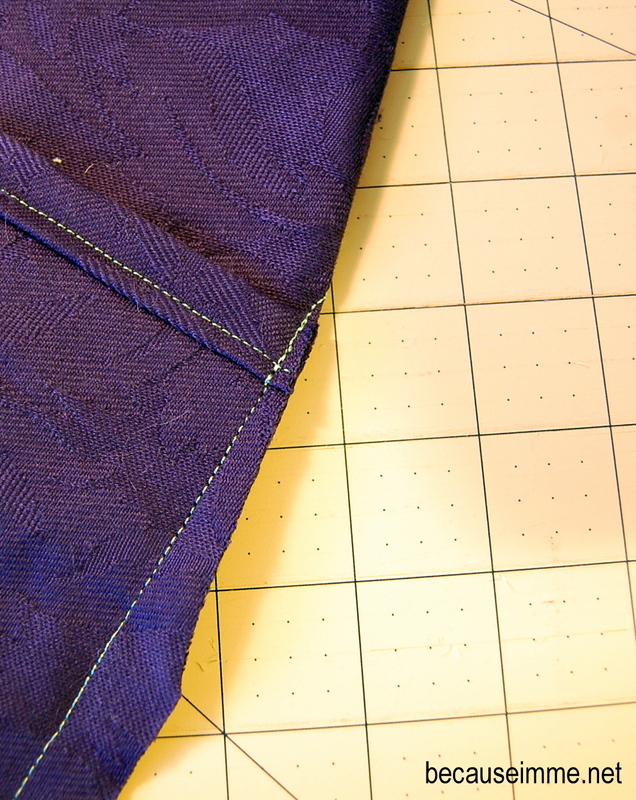 Pin in place with hemmed edge 5" from top of previously created fold (or 2" up from other hemmed edge). Fold bottom edge of fabric up about 1". Pin in place. 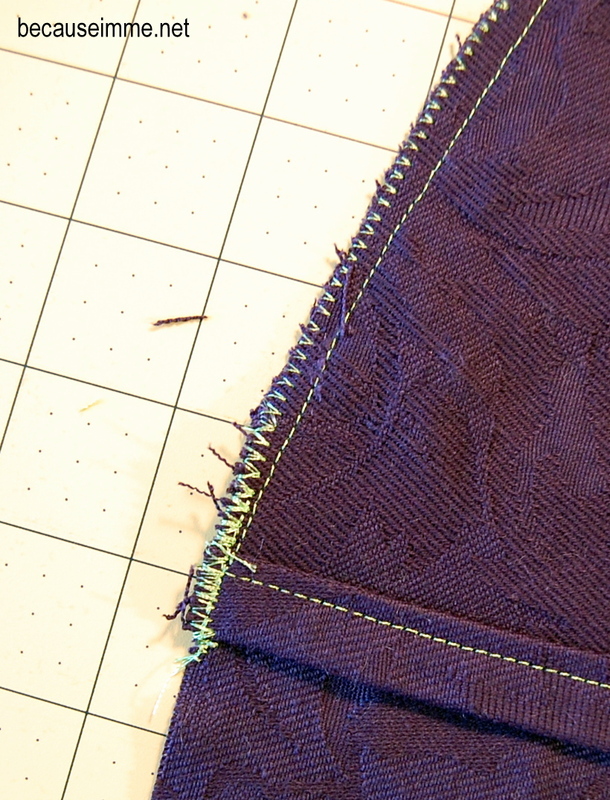 Stitch in place, stitching very slightly over top of hem. 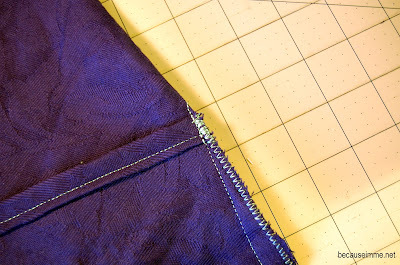 Reinforce stitching at hem and bottom fold. Trim at hem. 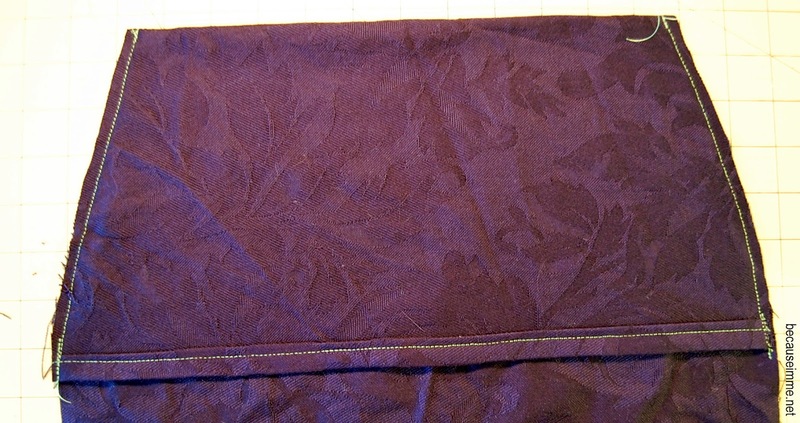 Edge stitch, reinforcing at hem and bottom fold. If you make one (or many) of these please share a link to images in the comments, or send to becauseimme@gmail.com. I'd love to see what you come up with! 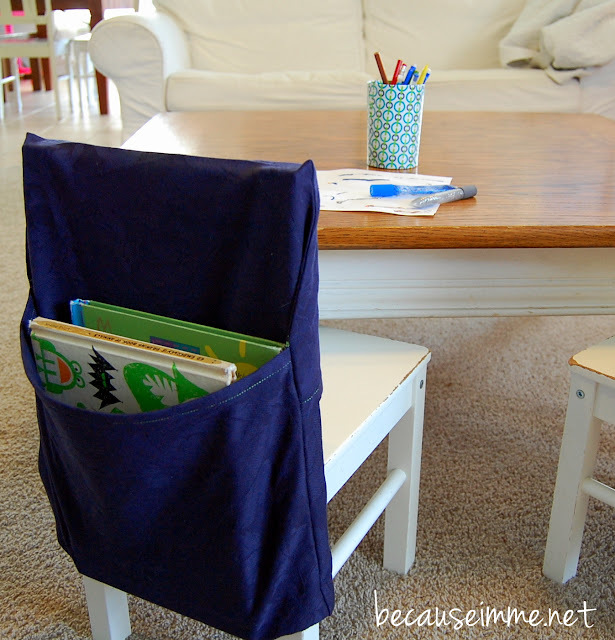 And then : awe and amaze your family with your organizational and creative genius. I love these chairs and think I must find some! Thrift shop recommendations?? I just started making the 30 I need for my classroom. Thank you so much for this tutorial. It is the most cost and time effective one I found. The first one took a while, but now they are going quickly. If only my sewing machine would stop fighting with the upholstery thread, it would be much quicker. Thanks again! So I followed the pattern and the first one I made I took to the school classroom and we couldn't fit all the books in the pocket. 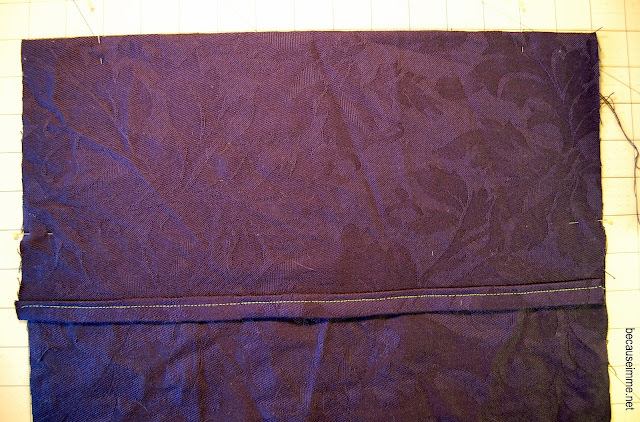 So instead of cutting off the access material after sewing up the pocket sides, I sewed edge to edge so there is access material for the pocket. Much better. More items now fit in the pockets which the kids in 1st grade needed. Thanks for the pattern.